About Us – Success Won't Wait! 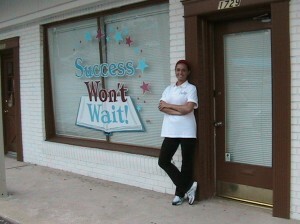 In 2005, Success Won’t Wait moved to its present location in Wilmington, Delaware. Pictured is co-founder Vincenza Carrieri-Russo. Success Won’t Wait volunteers organize used book drives, calling on ordinary citizens to donate used books for redistribution in the community. To date, dozens of book drives have been held throughout the Mid-Atlantic at many different types of locations. Both private and public schools — from pre-schools to the University of Delaware – have become involved. In addition, businesses, retail locations, churches, and civic associations have also agreed to become book drop locations for donations, or have themselves become large book donors. But the greatest outpouring is consistently shown by countless individuals, who have scoured their garages, basements, and bookcases for unused books in support of the program and its mission. Success Won’t Wait has collected over 1 million books, with approximately 45,000 of those currently awaiting distribution. After books have been collected, they must be cleaned and inspected for damage. Pencil marks are erased, minor rips repaired, previous owner’s names are blacked out, and spines are strengthened. Books are then sorted according to category and age appeal. Finally, a Success Won’t Wait, Inc. sticker is placed on the inside and outside cover. This identifies the organization as well as provides information to any reader who might be interested in donating or volunteering. Success Won’t Wait’s offices and warehouse facility are located at 1729 Marsh Road in North Wilmington. This office is staffed part-time and offers donors a permanent drop location as well as increased visibility in the community. Children’s Book Baskets. To date, Success Won’t Wait, Inc. has provided over 200 children’s book baskets to locations in Delaware, Pennsylvania and New Jersey. These baskets are filled with 30-50 children’s books and are carefully chosen to include something for everyone, from ABC’s, to easy readers, to joke books for pre-teens. They are placed, at no cost, in waiting rooms and lobbies where children frequently have to wait. Examples of placement locations include Kids Kuts, American Dance Academy, and Winner Ford of Newark. Creating “Independent Libraries.” Each library contains over 1,000 books that are specially chosen to reflect the needs of the population. Libraries are created in both temporary residential and day-only settings. Examples of libraries that have already been developed include: The Bayard House, a temporary residential facility for pregnant teens; Telegraph Road Learning Center, an alternative learning facility for teens with special needs; and Delaware Adolescent Program, a special high school for young parents and girls aged 12-19 who are pregnant; Exceptional Care, a hospice in Newark for chronically ill and dying children; and PAL Center in New Castle, a refuge for inner city youth. Siblings Christine, Ashley and Matthew McNeill supporting the Friends of the Hockessin Library with a book donation, 2005. Special Projects. Large book donations, frequently in excess of 1,000 books each, are culled from our collection for various organizations and groups. Examples include our U.S. troops stationed overseas (through the Operation AC program), Gander Hill and Baylor Women’s Prisons, Delaware Foster Grandparents Program, and Kent County’s P.E.A.K. Program. I am a guidance counselor at Elbert Palmer Elementary in Wilmington. I would love to partner with you to distribute some of your books to our students. I was wondering whether your program reaches into the Lehigh Valley in Pennsylvania. I work in the Allentown School District and personally work with ESOL and under-resourced students. I would be interested to know more. Thanks! We would love to be able to help you. Unfortunately, we don’t have funds for shippings. If we were to put together a large donation (500, 1000, 2500 books) would you be able to get them? We are located in Wilmington, Delaware just minutes from I-95. How will Sierra Leone will benfit from your books donation? Sierra Leone is country just from war,we reaally need this items for our schools here in Sierra Leone they lack this material. Hello and thank you for your message. Although we would love to help you with book donation, we currently don’t ship outside the US (unless we’ve partnered with another organization). I suggest that you contact World Book. They are located in Washington, DC and have a program that sounds like a good fit for your needs. Best of luck! I am the new director of a small library in Oaklyn,NJ. The library has been in jeopardy of closing but through the efforts of the community we have remained open. We have no budget for books and the ones we do have are pretty old. I’ve been removing those that are really old but do not have the money to get any more. I am a member library of the Camden County Library System in NJ. You recently donated books via Jen Druce to that system. We were wondering if you would be able to send any donations our way. Thank you. Do you take college textbooks? My DH and i were both college profs and have many books in history and science. I’m a retired N.Y.C. Reading teacher. I have boxes of literature and reading textbooks which I’d like to donate to this organization. However,I live in LONG,ISLAND N.Y and need to know the location I can deliver them to. I know they could be very beneficial in many ways. I want desperately to put them to use rather then collecting dust in the attic.All are in EXCELLENT condition. Thanks for all your caring and efforts for this cause. How can you donate from out of state? I have some used and new books I’d very much like to donate and be a part of your organizations success story. Where in New Jersey is the drop off station or where can I send them to? My phone number is 732-422-3137! I semi retired last year, just read your Family Circle article, and live in the Central Valley of California. This area has income challenges exacerbated by language barriers and cultural differences. I have been seeking a way to give back, and wonder if we could discuss a West Coast/California/San Joaquin Valley off shoot of your wonderful program? Please feel free to call, or email as you have time. And, thank you for the job you are doing. Hi, I have boxes of fiction and nonfiction books that I would love to contribute to SWW, but my books are not geared to kids. Would you be able to use them or are you looking only for kids books? I am a retired teacher in California. Is there somewhere out here that is a collection point for books for Success Won’t Wait? I am behind on reading my magazines and recently stumbled across your article in Family Circle. I am a Delaware resident and I am so happy to see such a good program in our neighborhoods. I am from lower Delaware and wanted to just suggest maybe creating more “drop off” locations in both western and eastern lower Delaware. Thank you for making our comminity a better place. Thanks so much for writing and your kind words! We’ve done a few things in lower Delaware, but I don’t have any real contacts (especially in Sussex County). If you know of any location that would be a drop location, please feel free to steer them in our direction! You are doing a GREAT job,keep up the work,and may God bless all of you. We are wondering if you have any one here in Greenville NC. ,THA WILL ACEPT USED NEW BOOKS OR THEY ARE IN NEW CONDITON. if so please email me at the above email address. Thanks and hope to haer from you soon. I would very much like to start something like this in my area of PA. Is there any business information that you could forward to me? Thank you in advance for any assistant that you could offer to me.